When eying the comprehensive list of new cars for 2009, one may spot some curious themes. First, there are quite a number of brand new SUVs and trucks. And second, that many large sedans and sports cars have become even larger and more powerful. Considering the past year’s events, those trends might appear odd. But because research and development of new vehicles can stretch over years, we are only just beginning to see the shift to smaller and more fuel-efficient cars. Whether you’re looking for a small car for budget reasons or because they are easier to maneuver around your neighborhood, these options are just a sampling of what the segment has to offer for 2009. The newly refreshed 2009 Honda Fit first gained mass appeal when it appeared on the market in 2007. To update the diminutive hatchback, Honda made small tweaks here and there, expanding the interior space, adding a navigation system option and increasing horsepower and torque. In typical Honda fashion, every improvement was completed without reducing gas mileage, which hovers at 35 mpg highway in the base trim. Honda has also kept the MSRP low, starting at just $14,550. Similarly to the Fit, the slightly larger Toyota Corolla has increased engine output while managing to maintain the oh-so-important fuel economy numbers, which come in at an impressive 30 mpg average. Exterior styling has been freshened so that the Corolla now sports a wider stance, and its interior space is more functional than before. Pricing starts at $15,250. In 2009, budget compacts are removing themselves from the typical bare bones features lists we’re used to seeing. For $13,550, the latest Kia Spectra has included more standard gadgets like satellite radio, cruise control and ABS. Taking tech options one step further is the compact Suzuki SX4. It has become the first car below $16,000 to offer standard navigation system on all models. The ultimate budget car, pricing begins at $13,299. Combining economy with performance, Mitsubishi added the Ralliart model to the Lancer lineup this year, slotting it nicely between the GTS – which received a significant boost in power with a new standard 2.4-liter engine – and their sedan on steroids, the Evolution X. The Ralliart stands apart from the GTS by implementing a tuned-down version of the Evo’s turbocharged 2.0-liter four-cylinder, its four-wheel drive system and Twin-Clutch SST transmission. Styling cues come from the more aggressive Evo as well. But pricing comes in closer to that of the GTS’s, at a reasonable $26,185 – a full $6,800 less than the Evo. 2010 models will also start appearing in showrooms throughout 2009 (yeah, don’t ask us about their wacky numbering). The Volkswagen Rabbit is up for a redesign during the 2010 model year. Bodylines may have been simplified, but the latest Rabbit is most likely going to have multiple engine and transmission options, in addition to the array of standard features one usually finds on a VW. The Mazda3 is a direct competitor of the Rabbit, and its popularity dictates that the highly anticipated 2010 design is up against some very high expectations. Like the most recent redesign of the Mazda6 sedan, almost every element of this car will see major changes. From early pictures and reports, Mazda has improved on an already great recipe. Capitalizing on the Scion xB’s trail-blazing ways, both Kia and Nissan are throwing their box-shaped designs into the ring. At a starting price of under $14,000, Kia is debuting their 2010 Soul in spring 2009. The Soul will feature a rigidly boxy design and two engine choices: a 1.6-liter or 2.0-liter four-cylinder with 122 and 142 horsepower, respectively. We can already see the power, unique styling and bargain base price wooing buyers over to Kia. 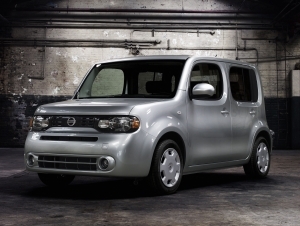 Already a favorite in Japan, the 2009 Nissan Cube also has a distinctly square shape, but edges are more rounded, and styling – including a wrap-around rear window – is more eccentric than that of the Soul. This spring, expect a quirky interior design, horsepower from a 1.8-liter engine that equals that of the Soul’s and a low price tag to match the competition. With less limitation on price and an eye toward luxury, we look toward two significantly updated compact sedans. Despite increasing the interior and exterior size of the 2009 A4 in almost every conceivable way, Audi managed to reduce the weight of the all-wheel drive model by 10 percent. Both the sedan and avant (Audi-speak for wagon) have more power on tap, but thanks to the weight decrease and a few other efficiency boosting features, the new A4 returns better fuel economy than the previous years’ – all while starting at $30,000 even for the sedan and $34,850 for the wagon. Its direct competitor, the BMW 3-Series, was not to be left behind, however, and completed a minor refresh for 2009 as well. The styling has been subtly modified and the iDrive controller for the navigation system has been redesigned. The real news though is that, for the first time in the U.S., BMW is now offering a diesel powerplant in the 3-Series. It’s called the 335d and gets a stellar 36 mpg on the highway with its 265-hp 3.0-liter turbodiesel engine. The diesel begins at $43,900, but the 328i finds itself just slightly pricier than the A4 at $33,600. You can be sure that these 2009 and 2010 vehicles are the leaders of the pack, influencing what automakers will be bringing to the U.S. in upcoming years as the feasibility of large, inefficient vehicles continues to decline. As the year continues and carmakers catch up with our country’s new expectations of the automotive market, expect this segment to grow enormously.